In Tasmania you won't run away from your problems, you'll bike. Tasmania. Mountain bikers have kept quiet about the outstanding trails here, but on an island crawling with outdoor adventurers a secret like this is tough to keep quiet. The characteristic dolerite columns so prized by rock-climbers and rapellers (abseilers) are especially dramatic here. Wildflowers abound in summer, and despite the stony plateaus there are also dense forests and moorlands that make most of us think of, say, Scotland. Mention Tasmania and most people think of skiing. 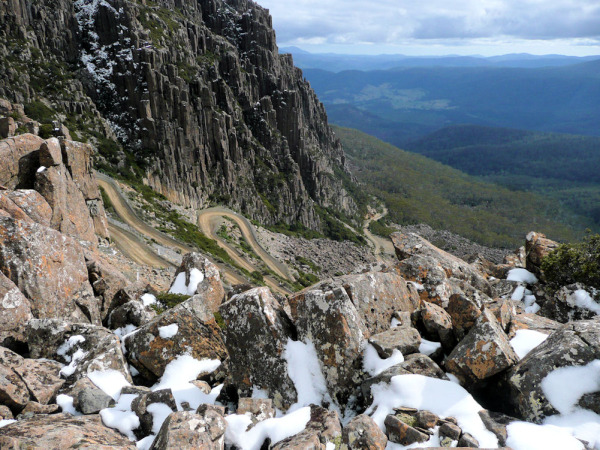 Yet Ben Lomond National Park, which encompasses the Mountain Range of the same name, offers a challenge for anyone who loves pedal power. It’s called Jacob’s Ladder.